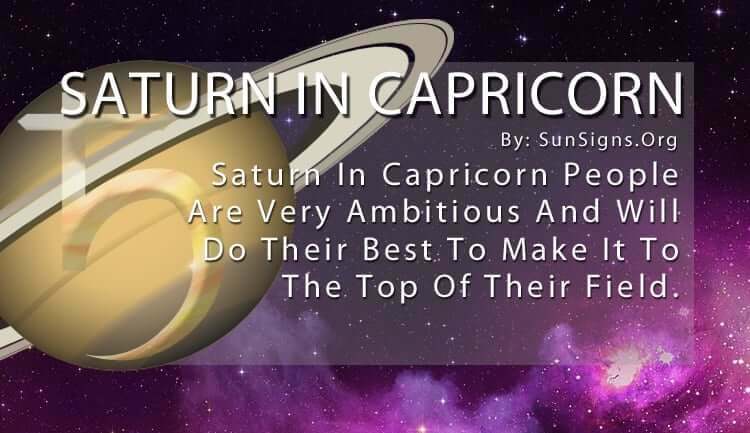 The Saturn in Capricorn people are very hard-working and perfect. But they should learn to enjoy life too. You won’t find a harder working individual than a Capricorn. This makes Saturn in Capricorn the most ambitious zodiac. Status is the most important thing to them, so they do whatever it takes to make it to the top of their field. Stoic and disciplined, they rarely fail. Saturn acts like a father figure in our lives, being authoritative and placing restrictions on our decisions. Luckily for Saturn in Capricorn, this is never a hindrance because they already live by a strict set of rules and standards that they place on themselves. They are extremely careful with everything they do. They take their time to make any decision. Saturn in Capricorn needs a quiet, almost empty environment in which to concentrate and get things done. They don’t like having any frills or distractions when working. They make the space around them as barren as their emotional stature. Being as logical as they are, they often come across as robotic to other people, almost completely devoid of feelings. And this may be true for everything except their career and their family. They always want what’s best for both, making them passionate (if you can call it that) about obtaining that goal. The Capricorn Saturn people can be quite persuasive when they want to be, making them great orators and effective negotiators. Their practical nature comes in handy in these matters. They automatically know the boundaries of any situation and how to work within those boundaries. This is one of the few things that gives them pride and joy in life. Some people become frustrated with the snail’s pace at which the Saturn in Capricorn move. But they are incredibly meticulous in all of their endeavors. So while it takes them a long time to do something, it is always done to perfection. This is why this planet in this zodiac sign don’t delegate authority and allow others to help. They are afraid no one else can measure up to their tough requirements. They are so detail-oriented and precise that they feel others are incapable of matching their skill set. They have very little fun or excitement. Saturn in Capricorn is all business all the time, and they have to be careful not to tax themselves too much. While they have incredible endurance like their symbol the goat, they are still human. And sometimes, they can forget that. This is the biggest obstacle for Saturn transit in Capricorn, knowing when they have taken on too much. They feel they are invincible when it comes to these matters because they are so capable of getting a multitude of things done regularly. But if they don’t actively seek out anything joyous in their lives, they can miss out on wonderful and fulfilling opportunities. They are sometimes held back by their rigid code, whether in their job or their relationships. This leaves an emptiness inside them that is difficult to fill. Saturn in Capricorn has to learn to break free of their structure once in a while and live in the moment. At the end of the day, when all the hard work is complete, they should sit back and enjoy the fruits of their labor. What good is comfort and security if you never take advantage of them?